Well, today was perhaps the most informative day yet of my time in Kyoto. 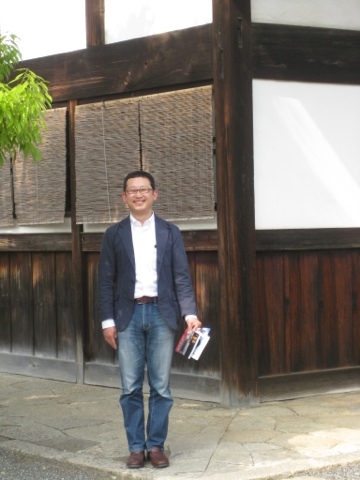 I spent most of the day with Daisuke Sasaki, a graduate student in the school of Practical Shin Buddhist Studies at Ryukoku University. 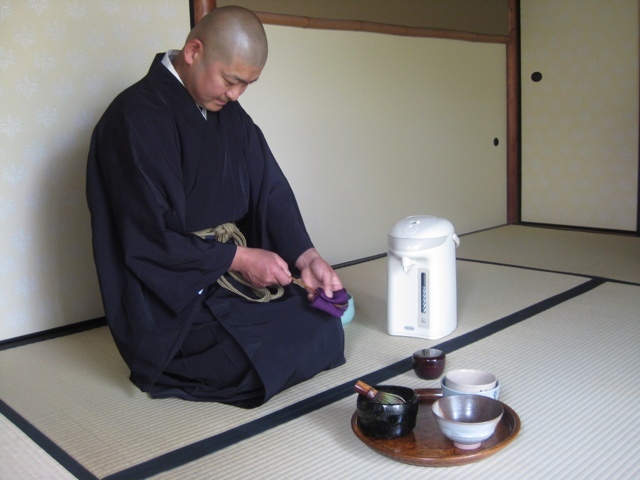 He is smart, kind, and speaks excellent English, and he told me all about the program for training priests at the university [again, this is a school affiliated with Jodo Shinshu Buddhism: the place where I am staying is next to the mother temple for that branch of Buddhism as well. 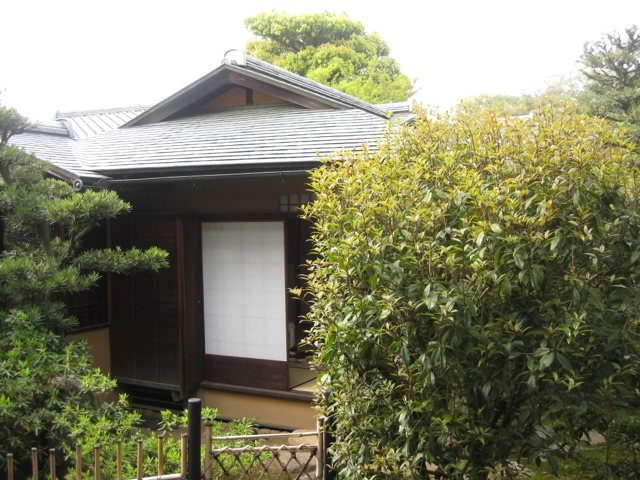 ], and then he took me up to the Zen temple where he lives–more about that in a minute. First, as I said in an earlier post, almost all of the students in training to be priests are “TKs”–“temple kids” [cute, right? That was from Daisuke!]. That means they come from temple families and will take over the temple from their father–women can be priests in Shin Buddhism but apparently not chief priests. Of 90 students in the program, only 15 of them are women, and almost all of them will become “Bo-mori,” which means temple managers–these priests entertain visitors, handle finances, etc., and they are ALL women. The program lasts 3 years: the first 2 years are coursework, and the last year is meant to be a practicum year, where they work as interns in a temple [sound familiar?!]. There are 5 full-time faculty [all male! 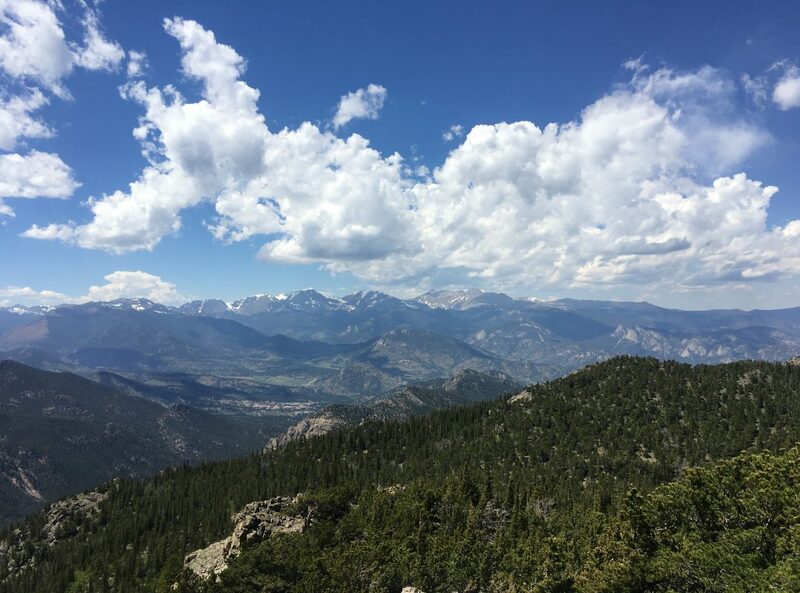 ], and many adjuncts; and the students take classes not only in Buddhist doctrine & practice, but also in counseling, bioethics and “Buddhism and Aging”–one of the full-time faculty members is a medical doctor: I thought that was interesting. Briefly, Pure Land Buddhism [which is an umbrella term in English comprising both Jodo-Shu & Jodo-Shinshu] teaches absolute reliance on Amida Buddha: all who call on him are promised rebirth in the pure land [where pure dharma is preached and nothing hinders one from attaining enlightenment] without having to work hard, be wealthy or powerful, etc., etc. Liberation is a pure gift from Amida Buddha, and doesn’t depend on mastery of specific skills, intense practice, etc. Honen first established Jodo-shu as a separate school, emphasizing the “nembutsu”–that is, reciting the name of Amida Buddha–and letting go of one’s own ego in favor of clinging to Amida and relying on his power, rather than one’s own. If you believe in Amida and call upon him, he will hear you and grant your request. Shinran was a disciple of Honen, and took his teaching even further, arguing that reciting the “nembutsu” isn’t so much asking to receive rebirth in the Pure Land, but thanking Amida for the gift [of rebirth in the Pure Land] that has been given already, before one even knows how to ask. [Do you see why some books call Shinran the “Martin Luther of Buddhism”? I’m not sure this is overly-helpful, but the parallels are unmistakable. Apparently for this reason Karl Barth said that Pure Land Buddhism was the only Buddhism worthy of attention.] 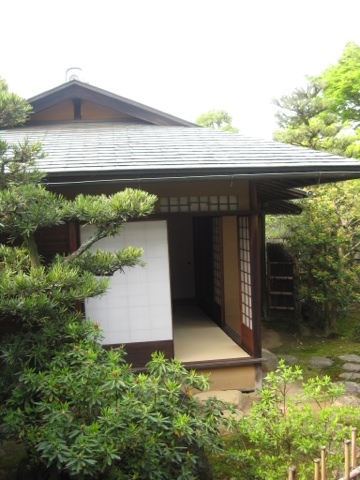 The way Daisuke explained the difference to me was to say that in Jodo-Shu Buddhism, the “nembutsu” is a bill–it is asking for something to be paid/given; in Jodo-Shinshu Buddhism, it is a receipt–acknowledging something that already has been given. 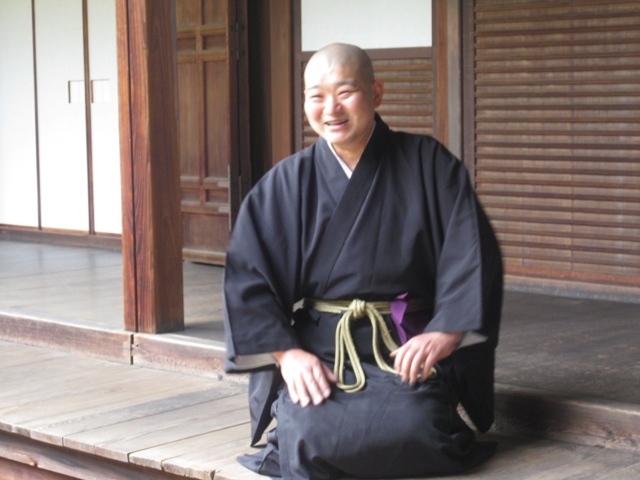 There are two branches of Shin Buddhism [Jodo-Shinshu], East and West. Together, they have roughly 25,000 temples in Japan, and are one of the biggest [if not the biggest] schools of Buddhism in the country. So that in itself was great, as was the tour of the different temples he gave me: again, beautiful gardens, beautiful buildings, beautiful spaces–as I have come to love in Zen temples. But the best part was yet to come. 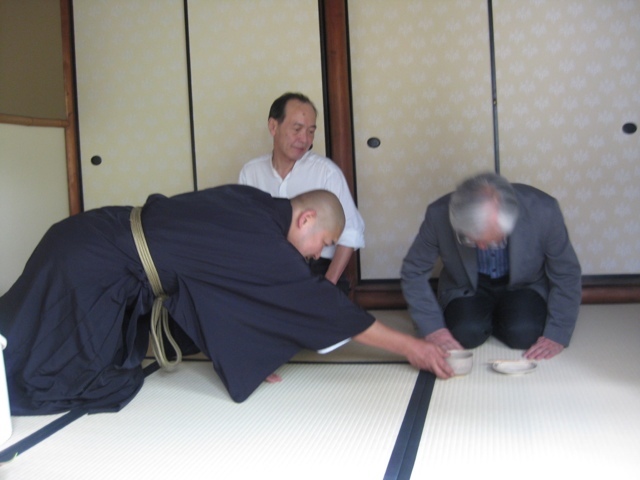 One of his friends–one of the Zen monks–invited us to his temple for a brief Zen service, and then a formal tea ceremony. I have been dying to participate in one of these, but you have to be invited–unless you just want to pay for a public one somewhere. 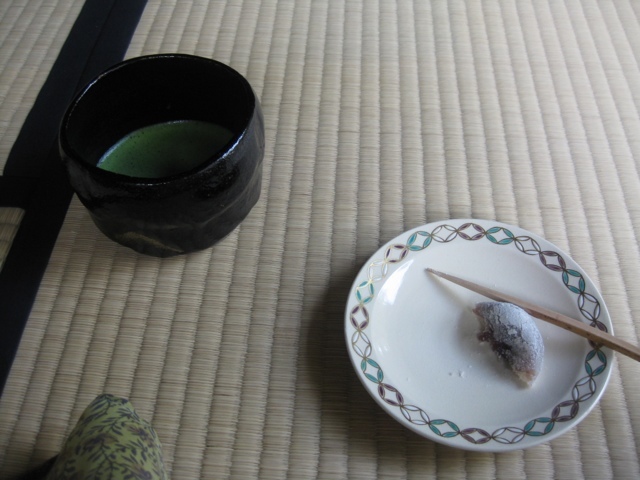 So, it was really, really great: the small teahouse was simple and lovely, and the whole ceremony was an art form. 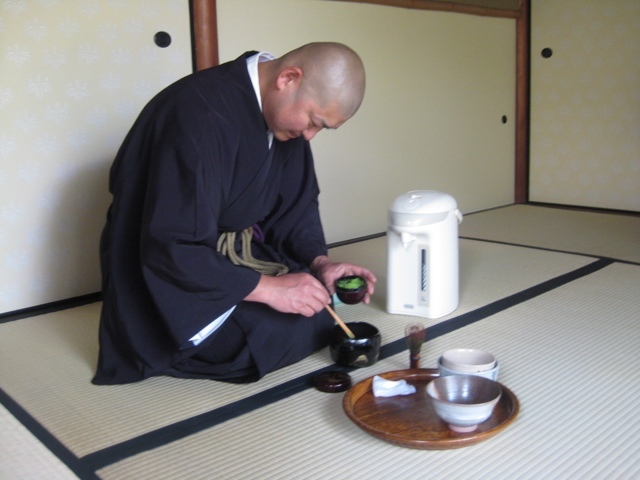 The tea ceremony has been called a “Zen sacrament” and after participating in one, I can see why. Then we walked all the way back, stopping at some temples and shrines along the way. All in all, it was a fabulous day! 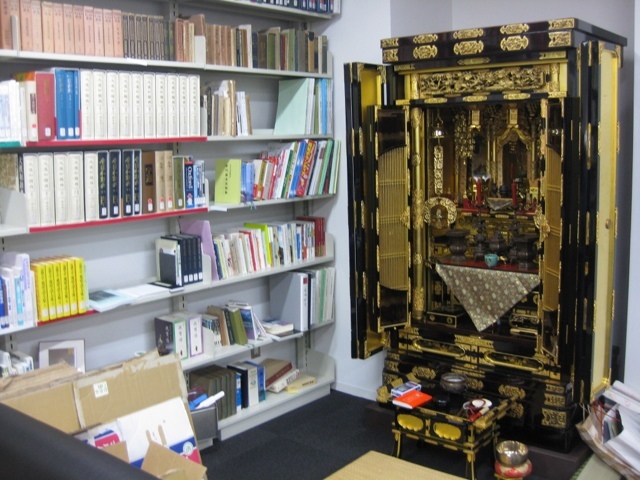 The other two pictures are of the altar that is in the student common room–they have regular services here. 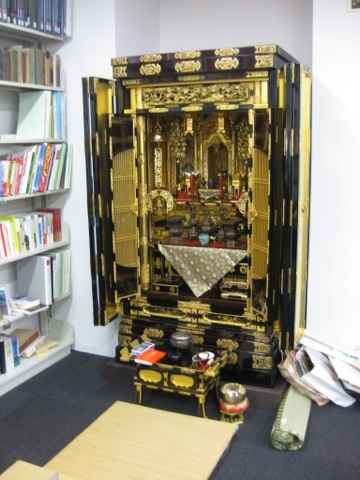 This is an (elaborate) example of a home altar–but apparently this one costs about as much as a Mercedes, so it is not exactly typical! Next: Next post: Goodbye, Kyoto!